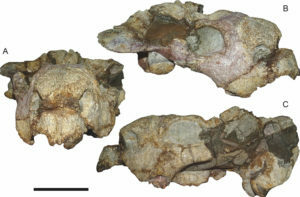 This week, a [study] was published that named a new dicynodont. Let’s talk about it! Dicynodonts eating plants. By V.O. Leshyk and the University of Utah. 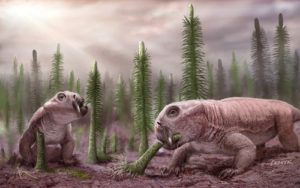 Dicynodonts are extinct herbivores from the Permian Period (298-252 millions of years ago). They are named for the two tusks that most of them had: di – two, cyno – dog, dont – tooth. Dicynodonts are not dinosaurs, though. They are synapsids. Land animals (mammals, reptiles, turtles, birds, and their extinct relatives) are divided into three main groups based on the openings in their skulls. Every skull needs to have openings for eyes, the nose, ears, and mouth, but some additional openings around the temple can appear for muscles of the jaw. Anapsids, the turtles, have no temporal openings. Diapsids, the reptiles, have two temporal openings. Synapsids, the mammals, have one temporal opening. An explanation of temporal openings. Anapsids across the top, with a turtle skull as an example. Synapsids in the middle row, with a dicynodont as an example. Diapsids along the bottom, with a crocodile as an example. Red circle is the nose, blue circle is the orbit (for the eye). Green and purple circles are the temporal openings. Dicynodonts are early synapsids, so they are more closely related to mammals than to other animals, even though they look like reptiles. 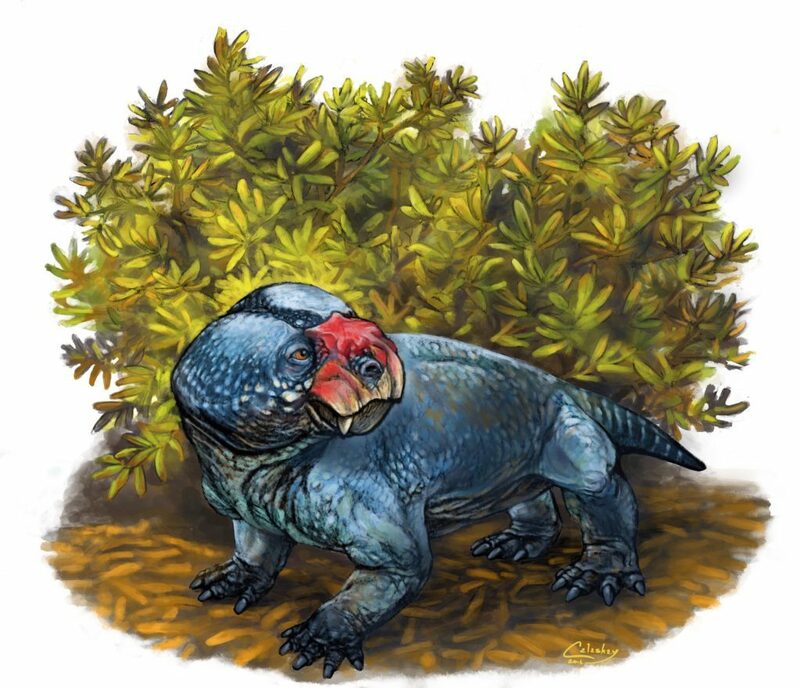 This new dicynodont is named Bulbasaurus phylloxyron: bulb – for the bulb on its nose, saurus – for lizard, phyllo – for leaf, and xyron – for razor (referring to the edge of the jaw that was sharp and used for cutting plants). 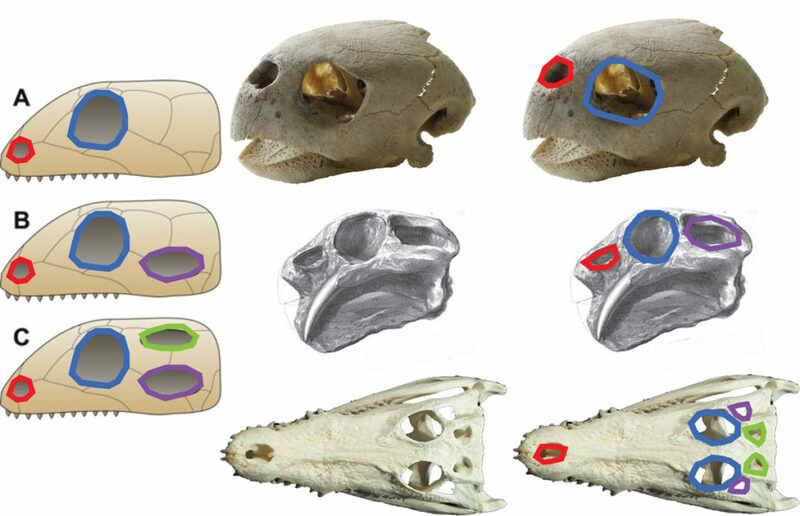 Figure 2 from the paper showing the new fossil skull in front view (A), the right side (B), and the left side (C). Bulbasaurus had a small skull (13-16 cm long), but had adult features, meaning it was an adult even though it was small. It’s also the earliest dicynodont of its family, the Geikiids, which allows us to adjust the timing of the evolution of this group. Artistic representation of Bulbasaurus by M. Celesky. This entry was posted in English and tagged Bulbasaurus, Dicynodont, Permian. Bookmark the permalink.